The RocketLinx® ES7528 Power over Ethernet switches from Comtrol are being deployed to connect intersection devices to remote traffic control centers. 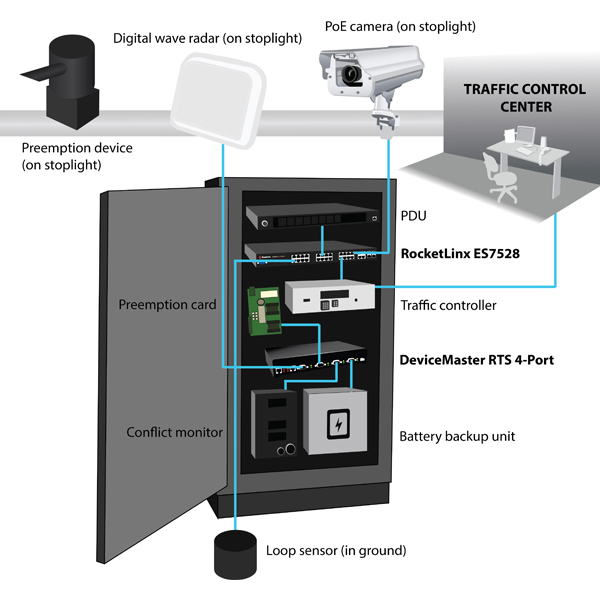 As depicted in the diagram, the RocketLinx switch is connected to PoE IP cameras, sending video feed through a controller to the traffic control center. The switch also directs other information such as preemption data, sensor data, stoplight detection to the traffic control center. The serial devices in the cabinets lack Ethernet connections, therefore needing Comtrol’s DeviceMaster RTS DB9 to relay the serial data up to the switch after converting it to Ethernet. This city chose the Comtrol RocketLinx PoE switches and DeviceMaster RTS device servers to upgrade its intersection monitoring system based on the products’ ruggedized housings, dependability, and exceptional performance.